This is the earliest version of Saboteur, and it's quite a bit different from the final. 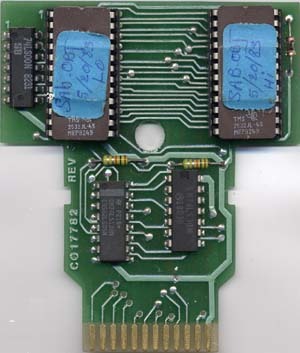 One of the biggest differences in this version is on the third board which is completely different from the final release. 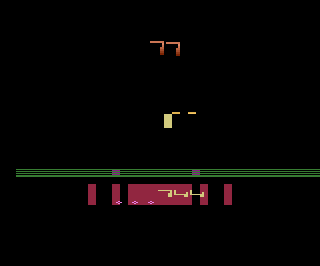 In this version you control a shape (which I guess is supposed to represent Hotot) at the top of the screen and you must shoot at the little pieces of the warhead you missed on the previous board. 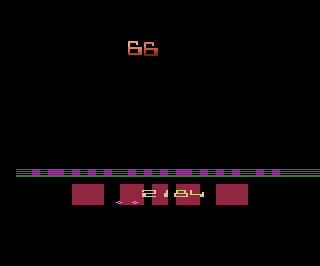 However in this early version the 'shape' is represented by a pair of numbers (obviously a placeholder graphic) which counts down continuously. You can move left and right, but it really doesn't help you avoid the pieces because they seem to hit you no matter where you are. Every time a warhead piece hits you you will take some damage. If enough pieces hit you, one of the numbers will disappear. When both numbers disappear you will 'lose' this board and go back to the first level. If you successfully fend off all the pieces you will earn some bonus points and then be returned to the first board. The flow of the game is also different in this version, as the boards do not advance sequentially. If you succeed at the goal on the current stage, you will skip the rest. This means if you stop the rocket on the first board you skip boards two and three. This makes sense from a logic standpoint (if you stop the rocket you wouldn't need to dismantle the warhead on the second board), but makes the game alot less fun since you usually only get to see the first board. This is complicated by the fact the difficulty is very easy in this version so you almost never lose the first board. Obviously HSW figured this out as it was changed in later versions. The word BONUS is not displayed as your bonus points are added up at the end of each level. There is a bug which allows Hotot to continuously earn points by shooting the skull symbol after killing a robot. Hotot can shoot lightning in any direction and it will not automatically home in on the Master Robot. Upon winning the third board the numbers will count down to 0 starting with what ever number it is currently on. The scoring is different. Blue Robots are worth 7 points instead of 23, The Master Robot is worth 7 points instead of 57, and letting a Gorfon (thief) successfully steal a rocket piece is not worth anything. Shooting Gorfons is also worth 7 points instead on 0.